Shotokan Karate originated in Okinawa, a small island south of Japan. It was popularized in Japan by Gichin Funakoshi in the 1950s. The name “Shotokan” comes from the name “Shoto,” which was Funakoshi’s pen name. Shotokan Karate is a traditional Japanese style of Karate. It combines both mental and physical training to refine the character of its students. Karate means “empty hand” as translated from its Chinese characters. As a result, Karate uses no weapons in its training, relying on the hands, feet, and body of its participants. Is Karate for Women and Children? Yes, most definitely! Karate is for all individuals — small, tall, young or old. The Shotokan Karate Institute’s youngest student is 6 and oldest is 85. Will I be able to defend myself physically? Students of Shotokan Karate, knowing that they can handle themselves in a physical conflict, feel confident, and thus are able to avoid most confrontations without resorting to a physical fight. If there is no avoiding a fight, the student of Karate learns to disable his or her opponent in one blow. What is Hanshi Sharifi’s background? Hanshi Sharifi is currently the highest ranking non-Japanese Shotokan Karate instructor in the United States. He holds the rank of 8th Dan (8th degree black belt). 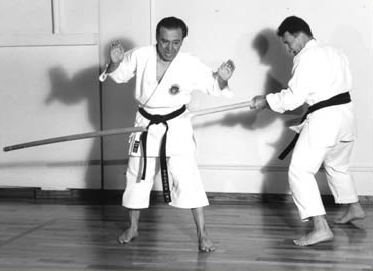 Hanshi Sharifi originally trained in both the United States and Japan. He then moved back to Iran where he started Shotokan Karate in 1971. Today there are over 10,000 students in Iran training in Shotokan Karate! In 1984, Hanshi Sharifi moved back to the United States and started the Shotokan Karate Institute in Oakland, California. In 1995, the dojo moved to the Central Avenue Shopping Center where its students built a custom hardwood floor ideal for Karate. Is Karate good for my health? Yes. Because Karate involves both stretching and cardiovascular exercise, it is extremely good for your health. Furthermore, unlike many other activities, Karate uses almost all muscle groups. This means that your body becomes very well balanced rather than overworked in specific muscle groups. Who are some of Hanshi Sharifi’s accomplished students? Mr. Michael Tabassi, 7th Dan, Karate Coach & Instuctor, Maryland, MS. The dojo is located in the Northern California, on the Eastern Shore of the San Francisco Bay. It is conveniently located at the El Cerrito/Richmond border, right off of Interstate 80, at the Cental Avenue Shopping Center . Take the”Central Ave./ El Cerrito” exit from Interstate 80.